Set in the early 1930s, Lawless tells the story of a clan of bootlegging brothers who rose to prominence in Franklin County, Va. Working from a novel by Matt Bondurant, director John Hillcoat and screenwriter Nick Cave try for the bracingly bitter tone of a Depression-era story that sometimes feels as if it’s out to recycle a variety of familiar western and gangster ploys. In this case, three moonshining brothers face off against a corrupt lawman. Bondurant’s novel, by the way, derives from his family history, and the movie begins with a title card telling us that it’s inspired by a true story. In Lawless, Hillcoat (The Road ) focuses on Jake Bondurant (Shia LaBeouf), the youngest of three Bondurant brothers and the tale’s narrator. 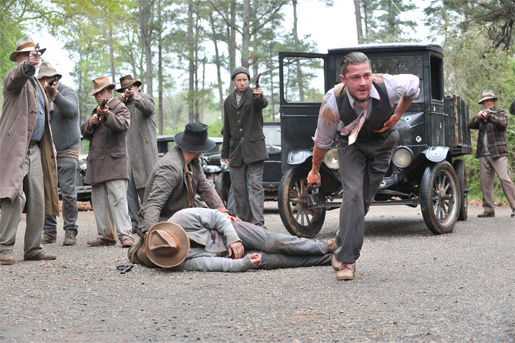 The Bondurants are hard-core moonshiners led by Forrest Bondurant (Tom Hardy). Brother Howard Bondurant (Jason Clarke) brings muscle to the proceedings. Jack is considered “the runt” of the Bondurant litter, a young man not naturally given to violence. In this case, the bootleggers aren’t the bad guys. That job falls squarely on the shoulders of Guy Pearce, who pushes the limits of stereotype as Charlie Rakes, a citified sadist of a lawman who travels to Virginia from Chicago. Rakes has been hired to enforce a system of payoffs to local officials. Fiercely committed to controlling his own affairs, Forrest refuses to play ball with the local pols, and the building blocks fall into place for a story that turns white-lightning outlaws into advocates for untrammeled independence. Lawless boasts an impressive supporting cast. Gary Oldman has a small role as Floyd Banner, a Tommy-gun toting gangster. Jessica Chastain shows up as a red-headed refugee from Chicago, a woman with a checkered past who hopes find a little peace in a small town. Chastain’s Maggie has an eye for Forrest, who — as played by the stoically impressive Hardy — seems as immovable as a tree stump. When Forrest thinks or speaks, he tends to start with a murmured growl that sounds as if it’s somewhere between a sigh and grunt. He’s the brutal brains and backbone of the Bondurant brothers’ thriving booze business. Hardy, who gave one of the bravura performances of cinema in the British movie Bronson, remains an impressive actor whose very presence can seem like a threat. When he really wants to make a point, Forrest uses a set of brass knuckles. Working with cinematographer Benoît Delhomme, Hillcoat gives his images a romanticized burnish, but when the screenplay calls for brutality, the director presents it with full force. The action builds toward a showdown between the Bondurants and Rakes at a covered bridge. LaBeouf doesn’t always seem perfectly cast as a young man who has an eye for a preacher’s daughter (Mia Wasikowska), but he has his moments. LaBeouf’s Jack lacks the killer instinct of his tougher brothers, a deficiency that sets up one of the movie’s big (and all-too-obvious) questions. Will Jake be able to pull the trigger when the chips are down? In the end, Lawless comes across as an artfully made genre piece that seems to have been aiming for quite a bit more: It’s not in a class with Hillcoat and Cave’s previous collaboration, The Proposition, an astringent western set in the Australian outback. You also may find yourself wondering about the moral calculus that turns the brutal Bondurant boys into heroes. Still, there’s a wistful air of longing about this violent movie, an attempt to hold onto a robust moment of Bondurant family history, even if that moment doesn’t quite rise to the level of legend.